Today I have the honor of posting an interview with Adam Holt, author of The Conspiracy Game. I know Adam from another lifetime, from what I now call the “under-just-grad” days, when we had just graduated from college and were setting our path towards adulthood. We worked in the same educational center, and even though we only worked together for a few months, I remember many of our conversations quite clearly. Adam is one of those inherently wise people who really listens to what other people have to say, making it possible to have meaningful discussions despite fundamental differences in belief or opinion - a rare treasure in life. He is also the kind of person who inspires thought and self-reflection through the way he leads his life, the questions he asks, and now, the book he has written. It has been great to reconnect with Adam and get a chance to hear what he has to say about The Conspiracy Game! Your book, The Conspiracy Game, came out December 4. Can you tell us a little about it? Yes. First, The Conspiracy Game and I share a birthday (December 4), so that was a great present this year. 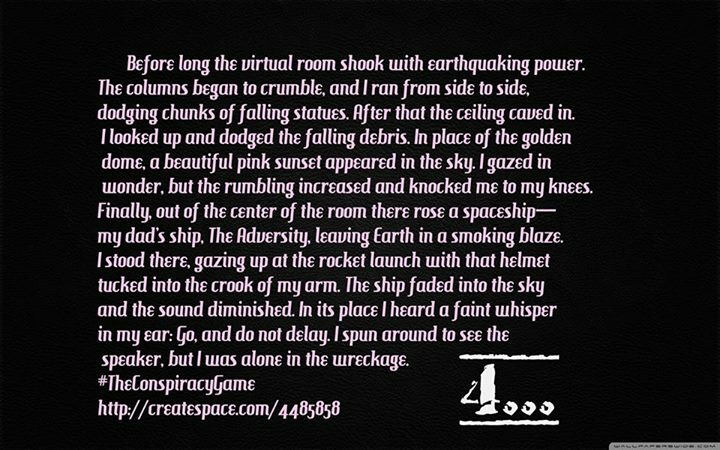 In The Conspiracy Game, 14-year-old Tully Harper recounts his first adventure in space. Tired of his dad's near-death experiences on Mars and inspired by a strange vision, Tully sneaks on board his dad's spaceship and begins the adventure of a lifetime. His best friends, Tabitha and Sunjay, accompany him on this trip, which will change the fate of the solar system. It's the first in a science fiction trilogy. The style is accessible enough for young adults, but the story seems to appeal to adults. My readers tell me it's funny and meaningful. They'd better be telling us the truth. Tully sneaks aboard the space shuttle without his dad father's knowing. What kind of challenges does Tully face in his relationship with his dad? First of all, he's fourteen years old. It's a natural challenge for adolescence--they're subjected to so much change, and so are their relationships with their parents. For Tully, that's compounded by the fact that he is withholding some enormous secrets from his father, his only parent. He loves and respects his dad but finds himself caught in the midst of secrets and lies. I remember some of those episodes in my own adolescence. I know that faith is a, or perhaps, the driving force in your life. How has your faith influenced your story? My faith in Jesus Christ underpins the things I do, whether writing, reading, or teaching. Faith has a powerful thematic impact on the story, though it's not always intentional. Many of The Conspiracy Game's themes are drawn from my life experiences with my faith: learning to love someone in difficult situations; forgiving yourself, your friends, even your enemies; trusting your parents' wisdom; trusting your childrens' insights; sacrificing for those you love. Also, Jesus was an amazing storyteller. He told wonderful parables, such as the prodigal son or the dishonest steward, and then gave his listeners some room to debate over their meanings. We're still debating thousands of years later, and the better for it. I love that about him, and I wanted to tell a story that captivated my readers with some important, deep truths, but left open some big questions. If you read the novel, you will see this happen between Tully and the Harper Device. Your protagonist is a 14-year-old boy. What inspired you to tell a story about this often difficult time of life from the perspective of the child? Adolescence is just built for storytelling because there's such daily upheaval. For a writer, the protagonist can have the best and worst day of his/her life in a six hour period, and that's good for moving a story along fluidly. That certainly happens to Tully, and those experiences shape him noticeably by the end. His motivations shift from a fear of losing his father to a desire to help his father succeed at any cost. I love that shift in responsibility that comes at this age, particularly when circumstances make teenagers take on a larger role in their families. Some of my students made that transition when their families went through tough times, and I always admired them for it. At the same time, many of them were getting braces, falling in love, and watching ridiculous Youtube videos for fun. It's such an interesting slice of life. Tell us a little about the setting of the novel - outer space. What does the landscape of outer space add to the story? Great question. I want my readers to appreciate and understand that magnificent landscape. Space is a beautiful place where you can float weightlessly and stare into a field of a billion, breathtaking stars. It's also a place where a paint chip flying through space at 15,000 miles per hour could crack that window and end your life in a split second. It's a beautiful, rugged, surprising landscape. But part of traveling away from the Earth is looking back. I love this thought from Neil DeGrasse-Tyson: "We went to the Moon and discovered the Earth." Tully experiences such a moment as well, where he appreciates the lovely blue gem that we call home. The perspective of space travel often gives astronauts that sense of just how connected we are to one another, and how valuable and delicate our entire civilization is. How has Tully evolved as a character from your conception of him to his adventures in this novel? I developed the idea of a teen space explorer first, and then envisioned what kind of person he might be. If he wanted to sneak into space, he would need to be clever and curious like Harry Potter or Odysseus. However, he also needed deep motivation to travel into space. After all, Tully puts his life and his friends' lives on the line to go into space. Why would someone do that? Once I began to develop Tully's backstory, it became clear. Tully is from a single-parent home, and the minute I discovered that, his motivation to stay near his dad, who he deeply reveres and fears losing, told me how he would react in most every situation. Will we get to read more about Tully in the future? I couldn't give up on him or his friends now! Things just got interesting. He'll be returning in book two, The Rathmore Chaos, though I can't disclose his location. The Conspiracy Game introduces characters that will play central roles in the coming series, which covers more ground in our near solar system. Is there anything else you would like us to know about either your novel or your experience writing it? I gave up a great teaching job to write this series, and it felt terribly risky at the time; however, it has been so rewarding. If I find myself teaching ten years from now, I can imagine sitting in my classroom and saying, "Boy, I'm glad I took that risk. Tully Harper was worth it." But I could not imagine it the other way around--sitting in that classroom and saying, "Well, I'm glad that I stuck with this job and never tried to write those Tully Harper novels." Life is too short to leave opportunities on the table. The world is a better place when we make the most of our skills and opportunities. When they have a sense of purpose, humans do amazing things, like feed the hungry and send people to the Moon...or at least dream up ways to inspire others to do those great things. The Conspiracy Game is available at createspace, and you can contact Adam on twitter @adamholtwrites with any questions about the novel. Adam is available for speaking engagements--in person or virtual--to discuss the writing/publishing process, human space exploration, and run writing workshops. You can also follow his writing and travel adventures at adamholtwrites.blogspot.com and on Facebook at facebook.com/theconspiracygame. Congratulations to Erica, Kim, and Elaine, the winners of one of Natasha's beautiful placemats. Everyone has a favorite advent tradition - glittery paper calendars with windows to open, pockets with little surprises for each day leading up to Christmas, advent candles... We always have a glittery calendar (I love glitter) and it is great motivation for kids to get ready in the morning ("Girls who are dressed with teeth brushed can open their window! "), but we also love our advent spiral. It is a simple tradition of moving a candle around the spiral. If we are feeling extravagant, we'll put in 25 candles on Christmas Day and the entire spiral will glow. The kids spend a lot of time moving their ornaments around and counting the days until Christmas. Each year, Santa brings a new advent ornament. 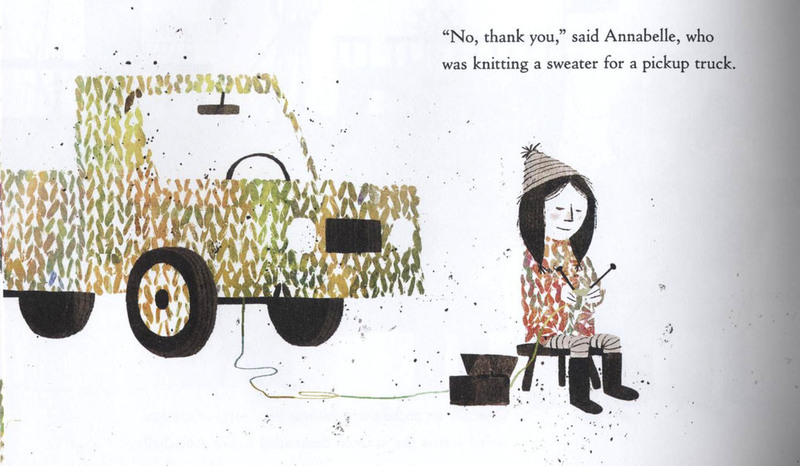 Alexandra's book of choice these days is I Want My Hat Back, by Jon Klassen, who also illustrated one of our all time favorites, Extra Yarn. I Want My Hat Back is a story of a bear looking for his missing hat - with a twist at the end that adults will appreciate. Excellent artwork, of course. 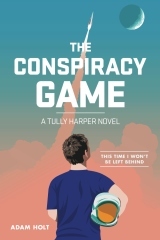 For those of you with kids in the young adult bracket, check out The Conspiracy Game. It was just released last week and the author, Adam Holt, is a phenomenal writer. I had the opportunity to interview him about his book and will be posting that on Wednesday! I'm not really one for crafts since I have no crafting ability and no patience to help kids with any form of organized project. So my strategy is to put out a few supplies and walk away. A few weeks ago we bought a box of 1000 craft sticks to boost another order up into the "free shipping" category. Huge success. All three kids have spent hours and hours creating little log houses, towers, piles glued together or to paper, dream catchers, and Christmas tree ornaments. A few sticks, some glue and paper and they are off - and they can do it without my help. What favorite toys, books, crafts do you recommend for holiday gifts? Please share! Emily's Balloon, by Komako Sakai, is an old favorite that recently emerged from behind the bookshelf where it went unnoticed for the past year. My mom bought this for Katherine before she was born, and my first thought was, "This story is sad!" I wasn't sure I wanted to read my children anything but beautiful, happy-ending books. But Katherine, and now Clara, love this book, and I have since changed my view on happy vs. not-so-perfectly-happy endings in children's literature. 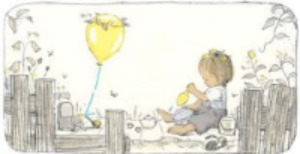 Emily's Balloon is simply written, leaving plenty of space for a child to fill it in with his or her own thoughts. The artwork captures the joy of a young child with a beloved balloon. It is a lovely story about beautiful colors in winter, and goodness in the world. 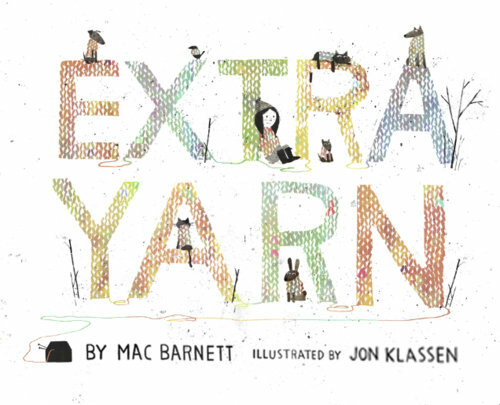 A perfect book for knitters and their children. Here is another book my kids love: Hailstones and Halibut Bones. As it states on the cover, it is best described as “Adventures in Poetry and Color.” It is a collection of Mary O’Neill’s poems about colors, illustrated by John Wallner. Katherine and Clara love for us to read from this book before bed, and we usually let them each pick one color. 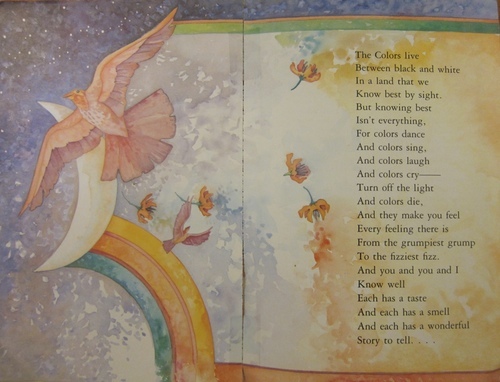 The last poem in the book gives a nice summary of what the color poems express. This book would make a perfect gift for anyone of any age. I am not a crafty person (in either skill or desire). I tend to like the idea of making things more than the reality of it. But every once in a while I’ll come across a project I think I can handle and give it a try… and sometimes it turns out. My latest project has been shooting stars and they have been a big hit. Katherine made one in her kindergarden class last year, which is where I got the idea (and if a five-year-old can make it, then that usually means I can too). They are great for birthday party favors, and they would make a perfect stocking stuffer. Here is my attempt at a tutorial. 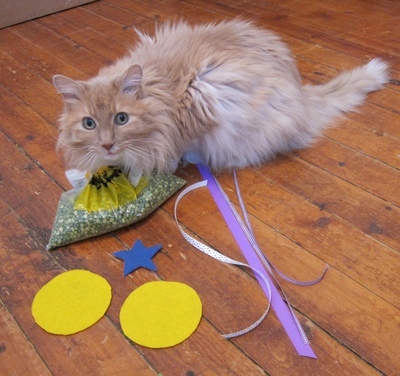 Step 1: Gather materials (two felt circles and a star, 3-4 strands of ribbon, split peas, needle and thread). You can also leave off the ribbons and just make bean bags. My kids love to fill bags with bean bags - I think they like the weight. There must be something about hauling around a heavy bag that is satisfying. In total defiance of my “Pacing the Holiday Season” post where I claim to ignore all things Christmas until December 1st, I am starting a mini series on simple gift ideas. I justify this by acknowledging that most people (a) enjoy looking ahead to Christmas/Hanukkah in November, and (b) don’t wait until the last minute to go into a Christmas/Hannukah shopping/making frenzy. Each week for the next several weeks I will post about a toy, book, or homemade something that we ourselves have enjoyed receiving/giving. I will even offer my first ever “giveaway”! The first gift idea is a book my children enjoy all year round: A Child’s Calendar, with John Updike’s poems and Trina Schart Hyman’s illustrations. The poems capture the essence of each month of the year, and I’m pretty sure the pictures depict Vermont. Written by Margaret H. Mason and illustrated by Holly Wlech, this book has beautiful images, through both its words and pictures. We pull this book out every summer… and sometimes in the middle of winter when we long for warmth and sunshine. Elisha Cooper perfectly captures the essence of a day at the beach - from the calm of early morning by the sea, to sunscreen, seashells, and crashing waves, to a summer sky as dusk falls and people head home tired, sandy, and happy. 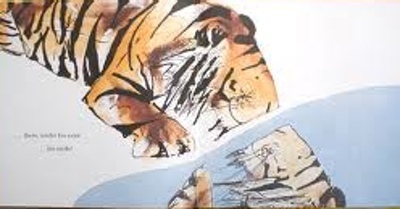 You can almost hear the wind and seagulls in his illustrations. This book is perfect to read before a trip to the beach, or if you can’t make it to the beach but wish you could. I love this book. 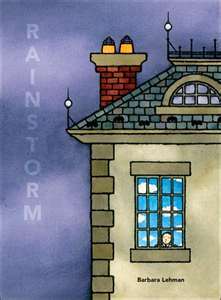 Rainstorm is a fun adventure and I think every kid wishes for a secret passageway like the one in this story. It is a “looking book”, as we call it, because there are no words. 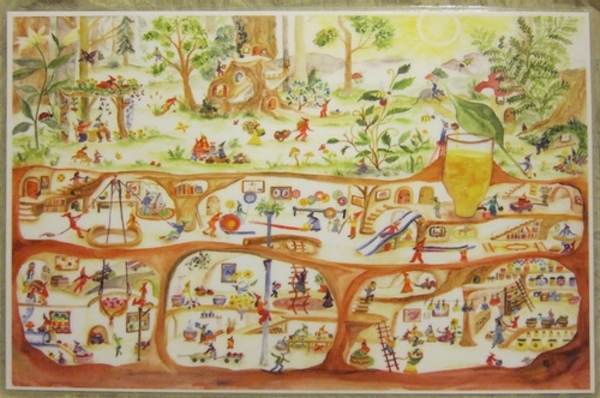 The pictures alone tell a detailed story, but parents and kids can make up their own versions. In our home, the children’s names and circumstances change regularly. Barbara Lehman has several books and all have a similar element of mystery, discovery, and adventure. But I think this one is my favorite. All the credit goes to my mom on this one. 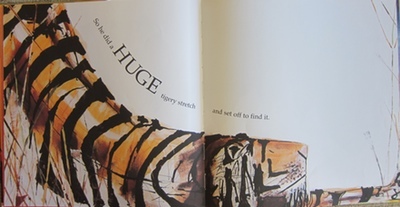 We had this book growing up and now I use it all the time to sing to the kids. The preface describes the book as having “examples of each genre of childhood music: nursery songs, ballads, play songs, lullabies, folk songs, spirituals, and work songs, plus a sprinkling of patriotic music.” Each song is presented with artwork from the The Metropolitan Museum of Art, along with an excerpt about the art, the song and the era. A nice combination of art, music, and history. 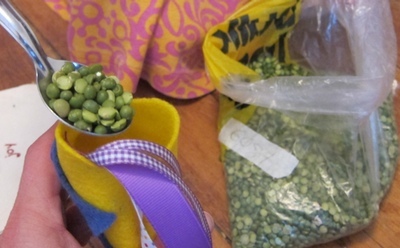 Our favorites: Billy Boy, Greensleeves, Lavender’s Blue, Oats, Peas, and Beans, Shenandoah, and Simple Gifts. It goes wonderfully with A Treasury of Children’s Songs (again, thanks to my mom). That way if you can’t read music very well, even after some 10 years of cello and flute lessons, you can listen to the songs and learn them that way. 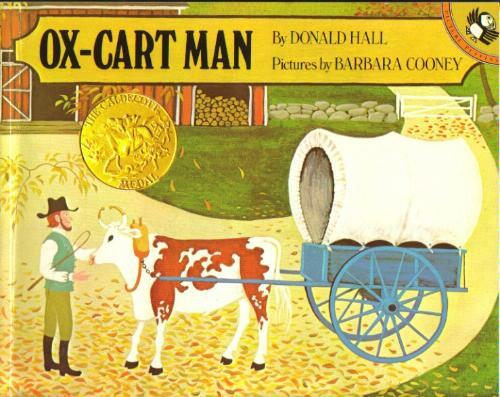 Katherine’s kindergarten teacher introduced us to Ox-Cart Man , by Donald Hall. It is a wonderful book about children helping out in the home, each having his or her “job”. It is a simple story and paints a beautiful picture about a family working together through the year. We have used this book to help introduce new chores for Katherine. 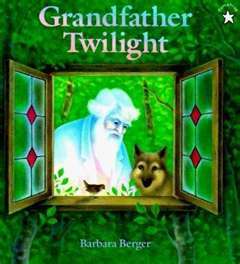 Grandfather Twilight , by Barbara Berger, is a wonderful bedtime story. Ms. Christine introduced it to us, and, like Ms. Christine, it has a peaceful, calming effect on children (and parents). Also, the artwork is beautiful.